Yep, I’ve re-worked my home…again. I can’t go six months without doing something. This time I’ve retained the basic sky platform, but with some differences, and have added a new house. The last time I played with things, I had no idea what I really wanted to do. This time it was easy: I wanted to get rid of the clutter and go for something clean and more suited to my in-world time. It’s great having things like a swimming pool and jacuzzi in-world, especially when they’re impractical in real life – but unless they’re used, they simply become fluff. Well, to me at least. There were things in the old build I wanted to keep – the gazebo, which receives a lot of use, especially when friends visit or I’m parked in-world, writing or working out-world; the planters and trees – although I wanted to improve on them and the greenery in general. I also knew which house design I wanted to use as well. So away I went, and here are the results. The gazebo, as mentioned, remains, but the pool area that was to the left as you look at the picture has gone, as has the dance stage to the right, leaving me with two lawn / grass areas and room to plant some impressive new trees. The walls / rails around the platform have also gone, replaced by sculpted hedgerows. 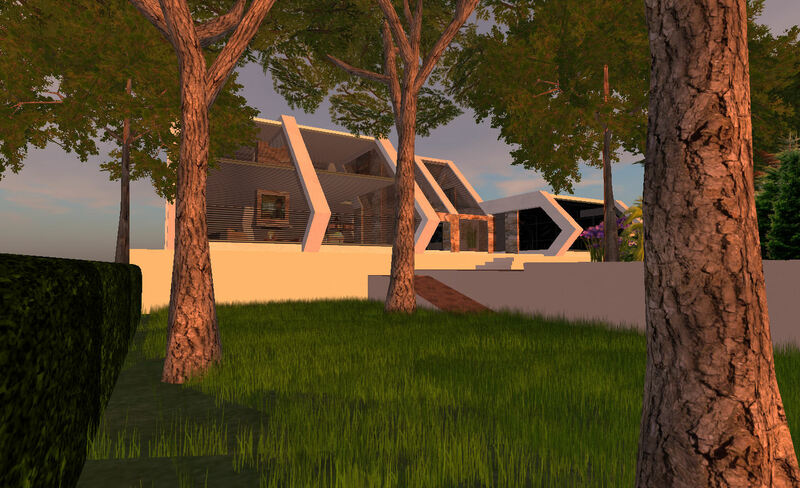 The house itself is a variation on my Canaveral 2 design, which I recently re-worked using the new prim size limit of 64m. I’ve wanted to use it for a while, if I’m honest, as I really like the look and lines. The lounge hasn’t changed in terms of furnishings, but the house design has meant I can bring my piano back into the lounge area, rather than having it out in the hall; I missed having it as a focal-point for visits. As per usual, I’ve opted for scripted lights (‘cos I’m lousy with textures), and as the photo shows, have hopefully got something warm and inviting in terms of tone around the fireplace and the indirect lighting. 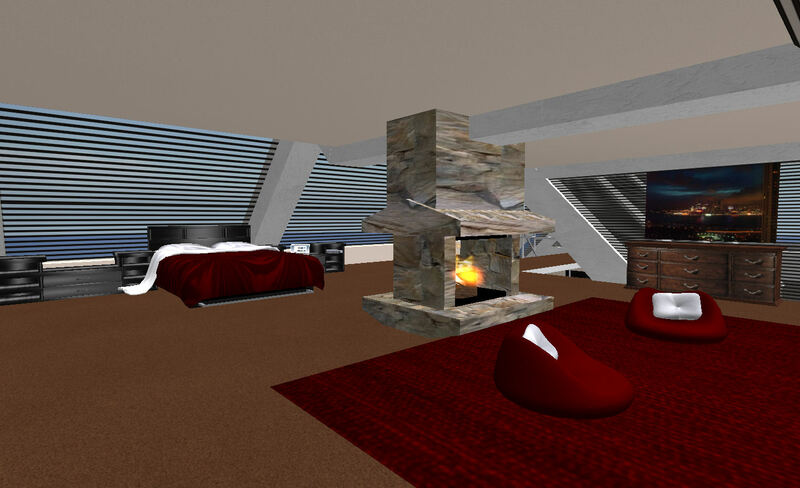 The bedroom is above the living room, and reached by a stairway and suspended landing I’m rather pleased with. Again, I kept to a central fireplace, as with the lounge, as this nicely divides the room in two as well as giving it something of a focal-point & extra picture-hanging space when I need it! 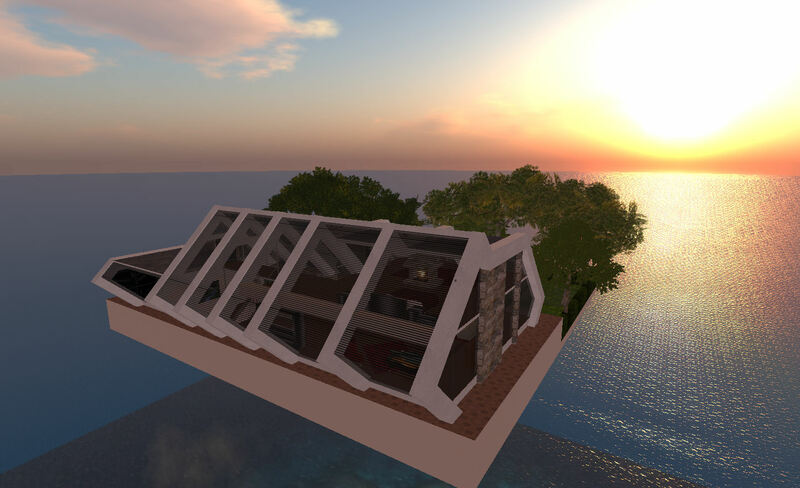 I didn’t bother with making the windows tintable – haven’t for a while now; being up in the sky, it’s not like I’m overlooked, and hopefully Firestorm will soon be able to access the new land privacy options should I ever need to go that far. All-in-all I’m pretty happy with the way the place has worked out; it still sprawls a littleon account of the scale, and I’m seriously considering taking up a suggestion from a friend and re-scaling this and some of my commercial builds to suit more “real life” avatar heights now things like Penny Patton’s camera adjustments and other ideas for a more immersive experience at catching on. Certainly, this house feels overly large given I have been using one of Penny’s camera positions for about six months now (even though I’m technically over 6ft tall in-world!). I guess time will tell on and further changes. For now, I think I’ll just enjoy the new house :). Home changed in conditions of furniture and house design has meant I can like piano back into the lounge area.Get the suggestion from a friend and scaling this and some of my commercial builds i loved.